Well time has come to say goodbye to fairy godmothers and princes and put away the glass slippers and magic wands, at least for the moment. I hope you had fun (I sure did!) and discovered a lot of interesting new authors, novels and fairy tales (I sure did!). I enjoyed putting together this event because it was a revelation to see that fairy tales are still very much alive and that so many modern retellings exist in so many different genres! 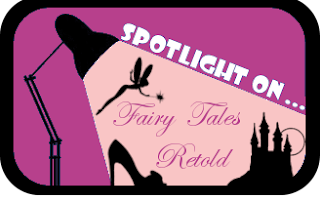 There are steamy fairy tale retellings, action-packed fairy tale retellings, graphic novel fairy tale retellings, funny fairy tale retellings just to name a few. I would like to thank all the authors for taking part in the event and for their generous giveaways and I would like to thank all my fellow blogger and reader friends who wanted to participate and share their story about their love for fairy tales. Thanks for joining us for the adventure and I hope you enjoyed the ride! ps: for those who are late to the party, you can check out all the posts here. And don't forget, all giveaways are open until 15 July 2011!